Been off the blog for a minute. Back at it. Trying to make up for lost time and present you with more dope and incredible music. However, this is the NEW face of the Sound Boutique blog. After many a copyright infringement and DMCA warning we have to handle our blog in a new manner. A bunch of our postings have been removed and/or deleted and our viewers have been unable to enjoy them. So, we'll be presenting future posts and all content from here on with YouTube videos. We will be posting videos on YouTube from our collection so you won't be getting just material that is already available there, but rather original content from us. At least that's the plan. I do also suggest that our readers please continue to share with other readers by sharing links to the mp3 files as anonymous in the comments section. So, I suggest people look in the comments section for any or our posts. 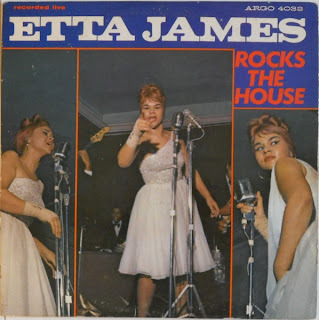 Etta James came onto the music scene LONG before I was born. And, it seems her musical legacy is ever lasting. I got introduced to her as a kid, as a young mod kid in fact, and her impact on me was tremendous. I forget which album it was that I was first introduced to, but I've stayed a long and true loyal fan of hers ever since. I'm pretty sure it was this album, but I'm not sure. It seems to me to be far too incredible and amazing LP of hers to have as a young teenager. But, it likely was.. and likely was a re-issue put out by Chess and purchased by me through Columbia Music House or Columbia Record Club. As many of you know, she passed away earlier this year. Rumor had it she was sick for a while before her passing. Many folks throughout the soul community morned her passing. She was a absolute soul hero to all of us. Although LONG overdue here at the 'boutique' we want to have a moment of silence for our incredible soul sister Etta James. I had originally intended to post this back in January of this year, what feels like almost a year ago now. When I heard the samples of Etta in the Flo-rida song that my 11 year was listening to, I had to whip an education on her. After about 45 minutes of enjoying her music my daughter admitted she liked her. It was cool to give he a lesson of where things come from, the sampling of her decade likely will not be the same of my era. On another note, I think a good indicator of a quality wedding deejay is whether they play the original version of 'At Last' by Etta, or the remake by Beyonce. I recently had to endure a horrible wedding deejay and amongst tons of other horrible music he played the far less superior Beyonce version, which to me is almost sacrilegious. Or, at least some kind of crime. Today's offering is from a Cadet 45 from about 1968 or 1969. 'Fire' is a scorching tune,no pun intended. Not really a really one by her, and only a small sample of her immense career. But, back earlier this year it struck me as one tune I wanted to play in her honor at one of my gigs. So, here we are catching up with what we should have given you at the beginning of this year, not the almost end of it. Rest in peace Etta, you are greatly loved and appreciated.